Open up the YouCam Makeup app and either click on ‘Makeup Cam’ to instantly experience a variety of real-time live makeup styles, or take a selfie. Adjust the placement of dots on your eyes, lips, and other features to help the facial recognition technology find the exact dimensions. Apply makeup in categories like eyes, mouth, face contours, hair, and complexion in any style you’d like. Keep it simple or go crazy—with Fashion Week-inspired styles and products from your favorite brands, costume makeup is even an option. Save it and show the world…whether you say you #wokeuplikethis is up to you. What’s more: Submit your supermodel selfie into a competition to win a grand prize trip to New York Fashion Week next year (flight and hotel accommodations included)! Through October 7, upload a selfie to social media using the hashtag #PerfectFashionWeek for a chance to win. The Daily’s director of marketing Anna tested it out for herself. 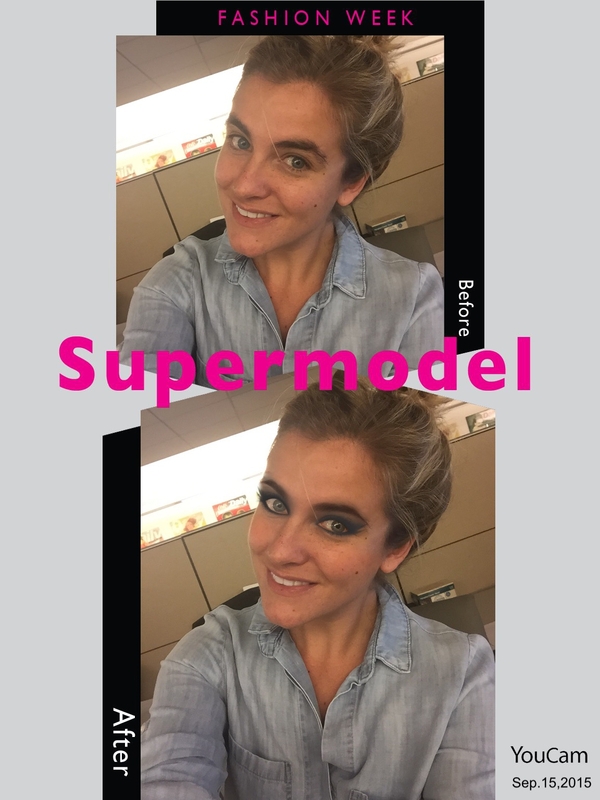 Check out her before and after, using the Fashion Week “Shy Diva” option.